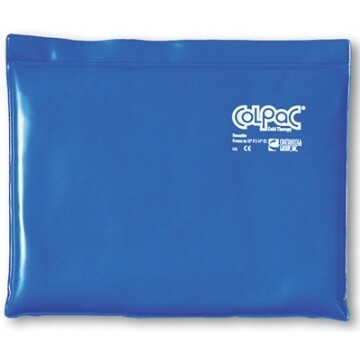 The Chattanooga ColPac Blue Vinyl Half Size delivers excellent cold therapy in a half-sized ice pack (7.5 in x 11 in) and helps to reduce swelling/inflammation, pain or fever. Combined with blue vinyl and latex-free material, the ColPac Blue Vinyl Half Size stays pliable during use and can last up to 30 minutes. Use after working out to prevent delayed onset muscle soreness or for injury, this ice pack is convenient, easy to use and is reusable. Note: The Chattanooga ColPac Blue Vinyl Half Size is for cold therapy use only. Do not heat for hot therapy. Not only does this colpac last for up to 30 minutes, you can shape it to meet your needs. As an over-60 softball player, I have a great need for post-game icing, this fits the bill better than any other cold pack, by far. Have ordered 3 more for wife and softball teammates. Pros: Stays cold for 30 minutes. Can shape it. Quality of product. Cons: None, perfect, as is. Great quality ice pack, soft & sturdy! Stays in place & stays cold longer than any other we've used.